Land Rover is promoting the Freelander 2 as a car that excels in both a natural environment and an urban landscape. To dramatize that fact, Y&R New York sought to show two characters fighting over the car, one character representing nature, the other representing city, almost like two children fighting over a toy. Artist Levi van Veluw was commissioned to construct and photograph two mannequins from scratch in his studio in the Netherlands. “City” consists of model cars and other miniature objects as well as small, wooden blocks. “Nature” features actual moss, grass, leaves, flowers and mud were used to create “Nature.” “Freelander 2 For all terrains”. 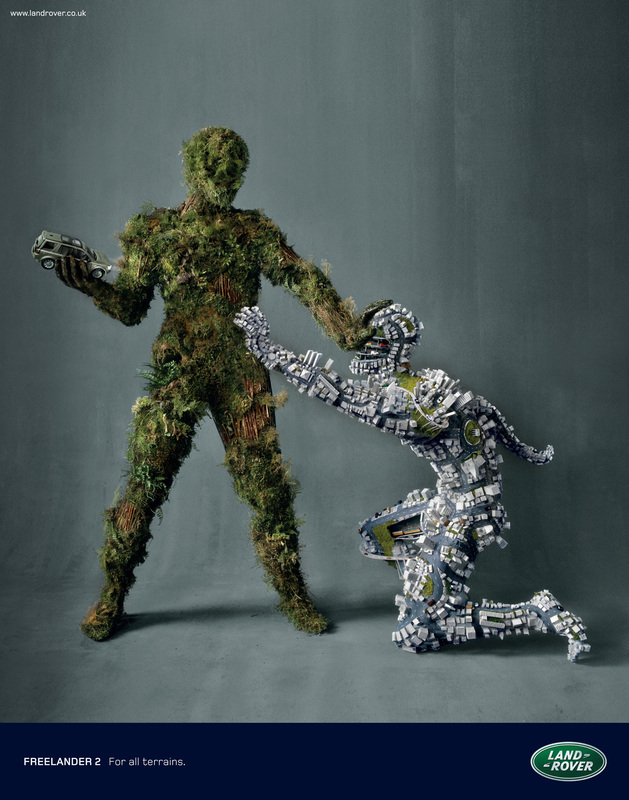 The City vs Nature campaign was developed at Y&R New York by executive creative directors Ian Reichenthal and Scott Vitrone, global creative director Graham Lang, creative directors Graeme Hall and Menno Kluin, copywriter Feliks Richter, art director Alexander Nowak, photographer Levi van Veluw, typographer Lee Aldridge, digital creative Raul Pardo, art buyer Helen O’Neill, and account executive Glynn Euston.